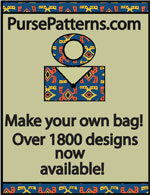 The LapTop Tote Pattern is a decorative but practical bag that is perfect to carry your laptop. This pattern uses repurposed men's jeans and a recycled men's tie threaded through the belt loops for extra color. 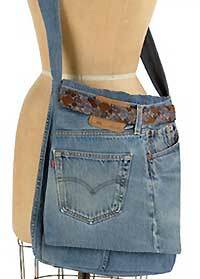 This is a Laptop Tote Bag Pattern made from repurposed denim jeans that is sturdy as well as practical! Instructions are given for a fabric lining and a vintage tie can be added to the jean belt loops for a special decorative touch. * Larger men’s denim jeans work better for this project, because the legs are wider. As a general guide, make sure you can cut a 14” wide piece from the legs when one of the seams is removed and the pant leg is laid out flat. ** Make sure you like the color and/or fading of all the denim jeans you chose when they are all sewn together as a whole. 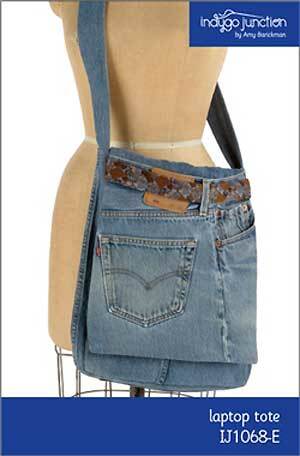 We wanted the purse to look like it was made from one pair of jeans, so we purchase used denim jeans with a similar look. You may like the look of different colors of denim and/or fading to give it a unique look. 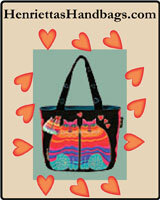 This downloadable pattern has a total of 7 pages. There is a 1 page cover photo and 6 pages of instructions and illustrations.